I think it's fair to say that everybody loves burritos? Yes? What's not to like?! Oh my god, it's just too much. I can't cope. All the things we know and love about burrito but open, in a bowl. Like a burrito salad? Kind of? But way better than any salad could ever dream of being... Sorry. And it's ridiculously easily, like, dangerously easy. Martin and I ate maybe 6 in a fortnight? But it's okay, everyone, because they're actually healthy!! There should be nothing stopping you now... Get cooking! Begin cooking the brown rice according to the instructions on the packet, this should be done first as brown rice takes forever to cook. Next, rub the chicken with the chilli powder, paprika, salt and pepper before cooking for a few minutes in a frying pan with 1 tbsp oil each side until lightly browned. Once seared, add the chicken and stock to a large pan and simmer over a low heat with the lid on for about 20 minutes. To cook the beans, drain most of the liquid from the tin (keeping a few tablespoons) and fry over a medium heat with 1 tbsp oil, the reserved liquid, 4 cloves of the crushed garlic, the cumin and salt and pepper. Stir occasionally. Make the Pico de Gallo by combing the finely diced tomato and red onion in a bowl with chopped coriander, a squeeze of lime juice and salt and pepper. Move onto the guacamole and mash the ripe avocado with a fork. Mash it until you reach a desired consistency, we like ours chunky but I know other people like it smoother. (If you don't have a preference I think chunky is the best way to go). Add the remaining garlic, salt and pepper to taste and a squeeze of lime. Mix well. Carefully remove the chicken from the stock and use two forks to shred the chicken. Drain the rice once thoroughly cooked (this may need to be done before the chicken depending on your rice) and divide between two bowls. This is the first layer of your bowl. Next layer is the beans, followed by the pulled chicken. Top this with the pico and the guacamole before drizzling sour cream over the top. If you are adding cheese, make this the last layer. Sometimes when I'm feeling particularly naughty I crumble tortilla chips over the top for an extra crunch. It is gooood. But this and the cheese is optional if you want to keep it a bit healthier. For a treat, though, I wholly recommend it. And lots of it. I really hope you enjoy my new favourite meal! Q. 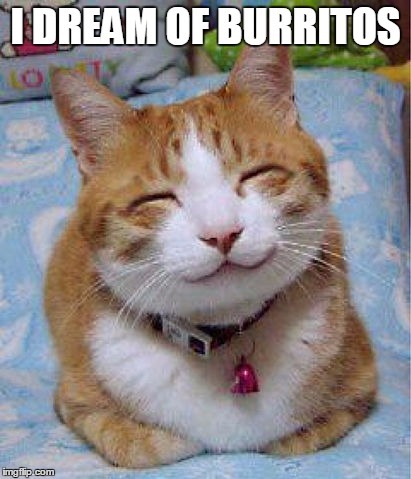 What is your favourite flavour of burrito? Q. Do you prefer classic wrapped or open burritos? YES YES YES. I'm so lazy with wraps and whatnot so this is perfect. We will just love your Burrito Bowl, it looks delicious! Thanks so much for sharing with Full Plate Thursday and have a great week!